with Our Printable 10 Minute Partner Workouts! If you can develop friendship bonds within your team, you will guarantee yourself athletes who enjoy their sport more, remain in their sport longer, and perform better in competition. As coaches, we all want to develop athletes with solid skills & tactical knowledge. But more importantly- don’t we also want to develop athletes who in 20 years will look back on their participation in sports and think “That was so fun…”? 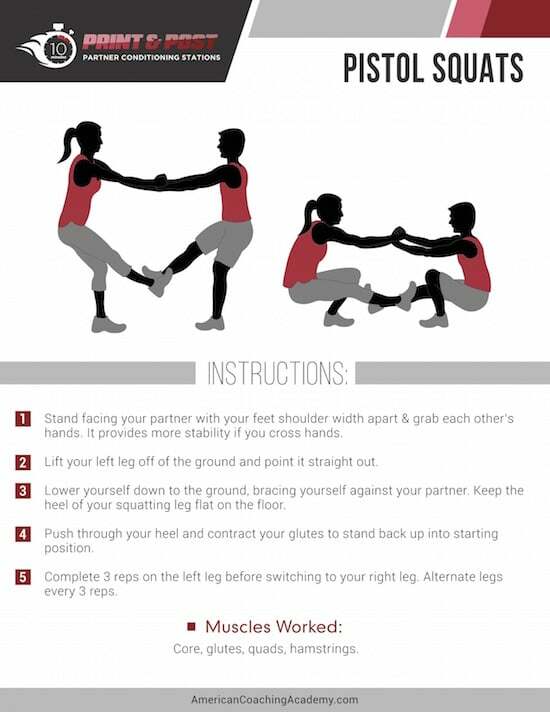 Today, we are sharing our 25 favorite Partner Workouts with you that are equally fun, unique, & effective. This is a revolutionary approach to organically build team friendships, unity, trust, discipline, and athletic conditioning. Plus, it’s a wonderful way for teammates to get to know each other and develop those friendship bonds. Partner workouts benefit all athletes, across all sports, regardless of age or gender. And the best news: these workouts take just 10 minutes to work their magic! The secret to fitting in valuable partner training into your practices is efficiency. We feel that our "Stations Model" is highly effective for youth athletes & coaches. Here’s the big picture: Each workout consists of 5 exercise stations, partners rotate from station to station every 2 minutes for 10 minutes straight. We’ve selected 25 partner exercises specifically designed for youth athletes. Each exercise has a companion printable poster for you to post for the kids to reference. There is an illustration of the exercise, along with a full written description. Each workout is comprised of 5 drills that have been carefully grouped to maximize training efficiency. You can rest assured that the workout design has been carefully crafted by some of the top conditioning experts at the American Coaching Academy. If you follow the plan, you will see a dramatic improvement in both overall fitness & team camaraderie. 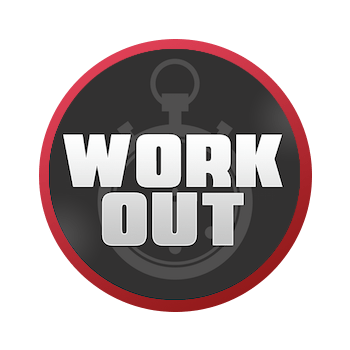 Print out the 5 Drill Posters that correspond to the workout you selected. 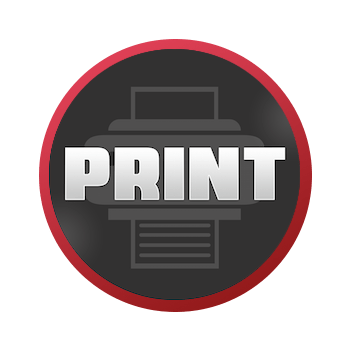 The posters print right from your home or office printer on standard 8.5 x 11 inch paper. 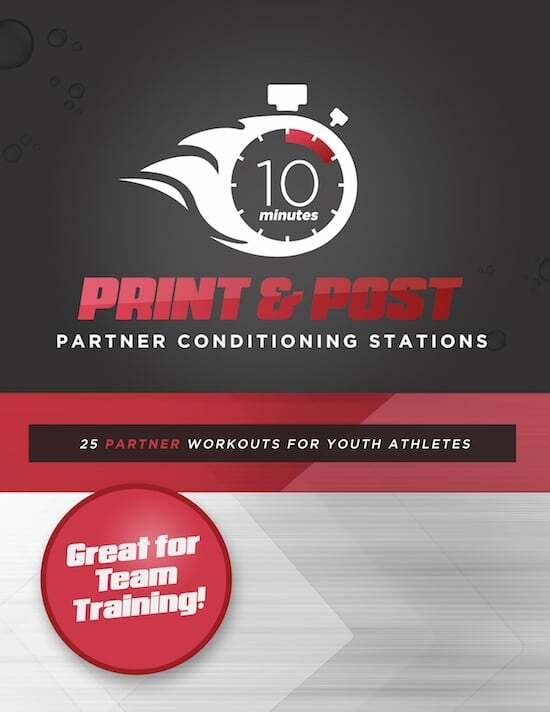 Post the exercise posters around your space (gym or field) to make 5 separate “Partner Stations". Go around and give a quick demonstration of each exercise. Explain that the athletes are going to be at each station for exactly 2 minutes each, and are required to hustle to the next station each time your whistle is blown. On your whistle, the Partner Workout begins. After 10 minutes, you are DONE! All the exercise can be done using body weight only. For some exercises, we suggest using small equipment that you surely have on hand (basketball, soccer ball, tennis ball, etc.) but this is purely optional and not required. The workouts really and truly take just 10 minutes- so anyone can work them into their practice or day! Wanting to develop close bonds within your team? This type of training works wonders. Plus, working out with a partner is FUN! It’s easy to adjust the intensity level up or down for your specific age group. Your athletes won’t get bored with our workouts. We have 25 different exercise posters, and only 5 exercises show up in each workout- so just about each workout is new and different. On each exercise poster are very clear illustrations of how to perform the exercise. We also include written instructions. Your athletes will always know what to do- so you should never catch them standing around! Limited Edition Bonus Gift for FREE! This gift is only available with the first 250 orders, so grab your copy before they're gone! 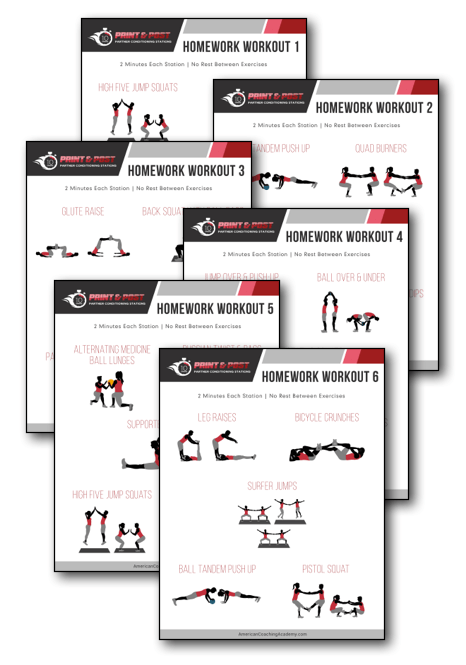 Give your athletes a little extra power boost with a "Homework Workout". These 6 printable one-page workouts provide a training cheat sheet for kids to reference at home. Do you sense some social friction with two athletes on your team? Assign the pair a homework workout to perform outside of practice to help them work through it. Have a new player on your team? Help them work their way into the fold by asking one of your veterans or captains to perform a partner homework workout with them. If parents approach you looking for ways they can help their child at home, provide a partner workout plan they can easily complete at with their child at home! 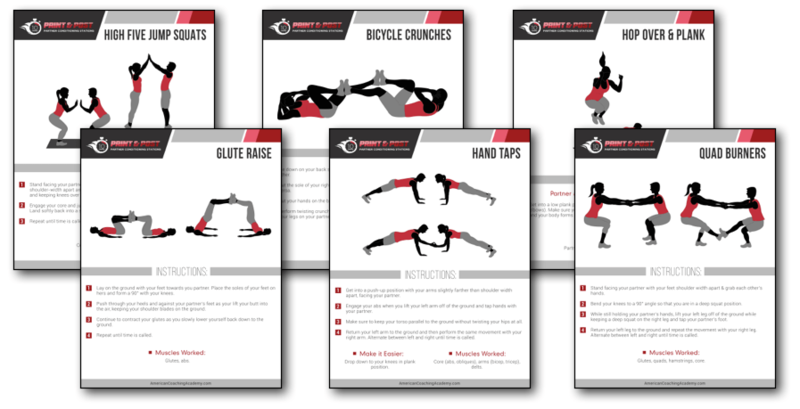 Just like the workouts and printable posters- print as many as you need, year after year! 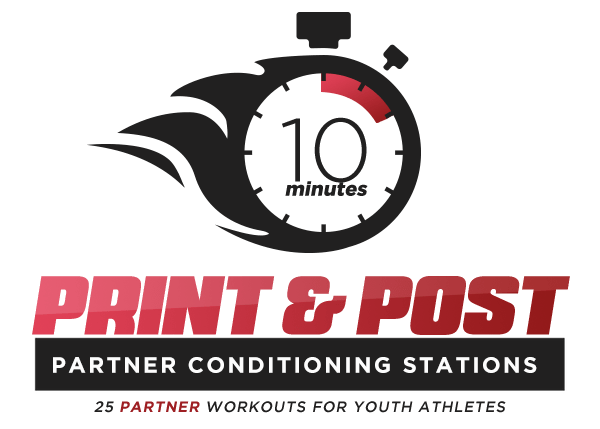 As soon as your order is securely processed, we’ll direct you to a download area, where you can get instant access to the printable posters and workouts. Print out as many of the printable exercise posters or workouts as you need (year after year!). 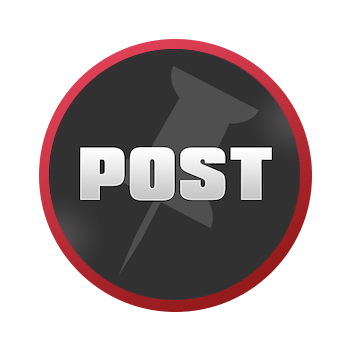 We are so sure that you will love the Print & Post Partner Stations that we are offering an unconditional 100% money-back guarantee. If you are not completely satisfied with the workouts, all you have to do is notify us within 60 days of your date of purchase and we will refund your money, in full, with absolutely no questions asked! That’s TWO FULL MONTHS to put these fun turn-key workouts to the test! What age level are these workouts for? Our workouts can be done with athletes ages 5-65+. We give you coaching tips to dial the intensity level up or down for your specific athletes. Do the workouts cater to a specific sport? No, we feel that all youth athletes can benefit greatly from partner conditioning exercises, regardless of what sport they play. Do I have to use the workout templates provided, or can I make my own? It’s up to you! The 25 workouts are 100% turn-key, you don’t have to think about which order you should put the exercises, etc. However, feel free to select any of the exercises you like and mix and match to design your own workout. You can also piggy-back two workouts together for added conditioning training if you have a little extra time. Can these workouts be used outside or inside? Is any special equipment required?